The Classic Children's Picture Book by Mary Pfaff, the Beatrix Potter of Hawaii. Hawaiian Heritage Press, 9781943476039, 32pp. When Alice Mongoose sails from India to a sugar plantation on the Big Island of Hawaii, she is shocked to learn what her new job entails. She decides instead to strike out on her own. When she meets the gentle and dapper Alistair Rat, she knows that she has found a friend in her new Hawaiian home. 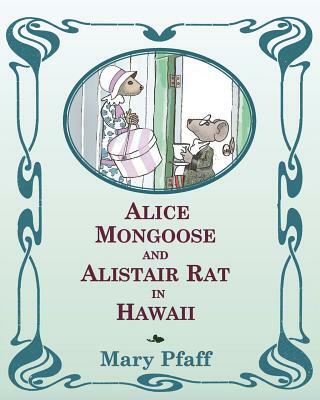 Alice Mongoose and Alistair Rat in Hawaii is the first book by Mary Pfaff, acclaimed in her day as the "Beatrix Potter of Hawaii." The Alice Mongoose and Alistair Rat stories are classic tales of adventure, resilience, and friendship, beloved to this day by children of all ages. Find out more at alicemongoose.com.